Disconnector (DS) or named as disconnect switch or isolator switch is used to ensure that an electrical circuit is completely de-energized for service or maintenance. Such switches are often found in electrical distribution and industrial applications, where machinery must have its source of driving power removed for adjustment or repair. 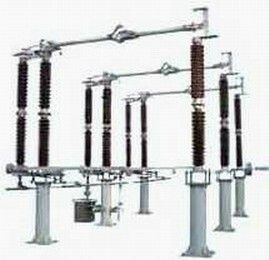 High-voltage isolation switches are used in electrical substations to allow isolation of apparatus such as circuit breakers, transformers, and transmission lines, for maintenance. The disconnector is usually not intended for normal control of the circuit, but only for safety isolation. Disconnector can be operated either manually or automatically (motorized disconnector). According to its structure and wheter be equipped with earthing switch, the DS can be divided into various types: non earthing switch, left earthing switch, right earthing switch, double earthing switches. Ø It adopts external pressured contact-finger structure, treated with silver plated on its surface. Ø New type contact head and finger, larger contacting area enables it to better heat dissipation, eliminate impact from skin effect, good self-cleaning and counter corrosion. Ø Good heat radiation effect.